Earlier this week, MS released the 1809 October 2018 version of Windows 10. This happened on Tuesday, October 2, in a somewhat less orchestrated fashion than for previous such releases. I blushingly confess I got caught in a snafu. Because the Download Windows 10 page said “Windows 10 October 2018 Update now available,” I assumed the Media Creation Tool (MCT) had likewise been updated as well. Wrong! That’s why it’s essential to check those Win10 Installer UFDs for version info before using them. In my case, that meant I did an in-place repair upgrade on one of my PCs from 1803 back to 1803. No harm done, however, and quickly replaced with 1809 when I realized my mistake. Sigh. I didn’t realize that this message didn’t necessarily mean the MCT had also been updated. For a short while, in fact, that was a very bad assumption. It couldn’t be simpler to check the Windows version for any Win10 installer. All you need to do is look at the details tab for the setup.exe file. The details tab in setup.exe properties shows Product Version info. That’s the tell-tale! To discriminate 1803 from 1809, you need to know that 1803 corresponds to version 10.0.17134.1, while 1809’s version is 10.0.17763.1. This is shown in the two side-by-side Properties windows above for each version’s setup.exe file. If I’d only thought to check I could’ve avoided my mistake. By the time you read this, it won’t be possible to “accidentally” download the 1803 installer using MCT any more. But if you’re like me, you have numerous Windows 10 installer UFDs at your disposal. Now you know how to check what you’ve got for version numbers. 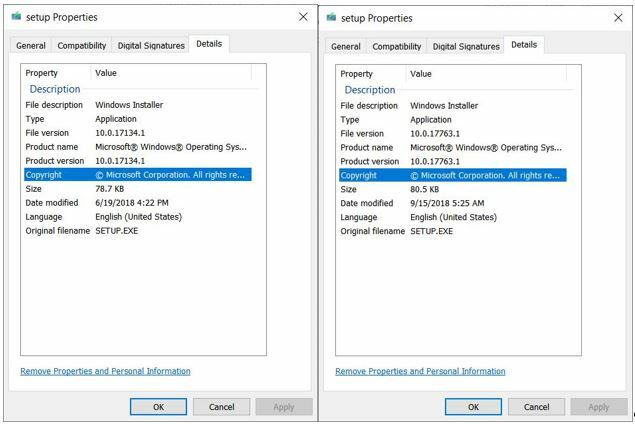 Then you can use Microsoft’s Windows 10 release information page to map those numbers to the corresponding four-digit version IDs (1809, 1803, and so forth). Enjoy!